Continuing from the last issue, the Rangers and the League take on Brainiac and Zedd's armies. Billy the Blue Ranger and Cyborg complete their Trojan virus that they manage to infect the drones and the Zord's with that releases them from Brainiac's control. The Rangers form Mega Zord and defeat Zedd. Afterward the League helps the Rangers return Angel Grove back to normal size. Finally, after a bit of socializing out of costume between the two teams, Zordon opens a portal to let the League return back to their Earth. Our final shot is of Alpha 5, walking back to the Rangers headquarters... "Aye yi yi yi.... I am Brainiac". The end... For now. Story - 4: A good ending to what seemed to be a very mismatched team up at first. Tom Taylor managed to throw in a whole basket of Easter Eggs throughout the series. Obviously this was going to be the issue that wrapped things up, after the big battle. So it felt like pretty much the last 5 minutes of a Power Rangers episode. I won't lie, I did enjoy reading this, it took me back to the days of my very short Power Rangers fandom, so I appreciated that. What I enjoyed most were the character moments, and how Tom Taylor managed to make certain characters shine. He certainly does have a decent handle on some of the DC icons. I'd like to read more DC work from him in the future. I liked the way he handled Superman in this, our boy big blue certainly was the leader of the League, and Batman the strategist. The nod to Lex Luthor's presidency was a neat surprise, with Lex's face on the $100 bill that Bruce Wayne attempts to use at the diner. Taylor certainly left it open for a sequel, with Brainiac leaving a trace of himself behind in Alpha 5. Maybe if they do decide to team up again, it can be a shorter series. 6 issues felt a little too decompressed. Art - 4: Steven Byrne did an amazing job with keeping his art quite consistent throughout the series. I feel that deadlines may have been an issue, hence why they were unable to keep a monthly schedule. But any artist that takes on all the art duties of pencilling, inking and coloring does deserve a little extra time to make it the best possible. I had said it before, Byrne's style felt very animated, so he's a perfect fit for certain projects like this. And I hope to see more from him in the future. Regarding this issue, nothing really popped at me to make me say, "Wow, that's awesome," but I did enjoy that there was an easy flow to the story. Every scene transitioned into the next rather seamlessly. Cover Art - 5: I love this cover by Karl Kershl. This has to be my absolute favorite of this series. The League leading the Zord's into battle, epic! 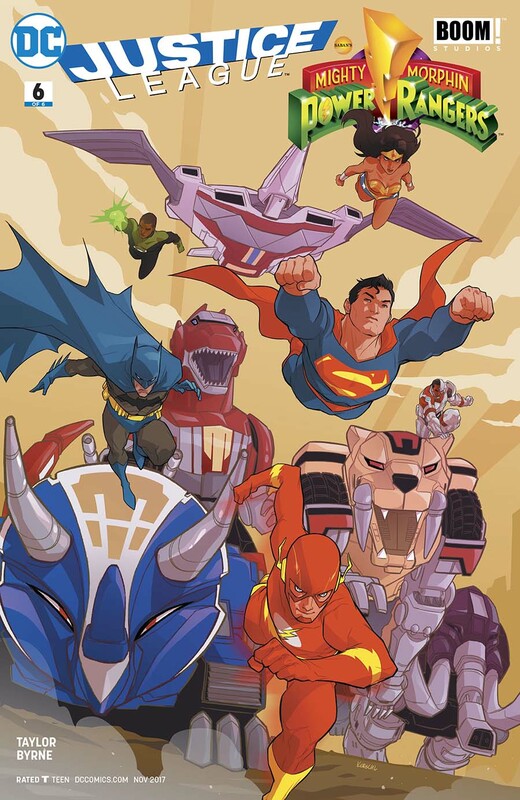 What I loved most was the colors on the Justice League. They looked very 80s Super Powers like, which of course was my gateway into the DCU, so I love the nostalgia of it.